Appealing to the value-conscious consumer, Riccar sewing machines are affordable and easy to use. These machines range from simple mechanical models to sergers and heavy duty sewing machines. Although new Riccar machines can be hard to find, many seamstresses enjoy sewing on vintage Riccar models. Although Riccar was once a major Japanese producer of sewing machines, today the company focuses most of its manufacturing on vacuum cleaners. You can still buy a new machine from an authorized retailer, and because of the quality of these sewing machines, used options also abound. New Riccar machines range in price from about $150 to over $700. Only authorized dealers can sell Riccar machines. The Riccar website offers a location-searchable list of dealers. Keep in mind that the relative rarity of these machines can present a problem when it comes to service. Before you buy a new Riccar, ask about where you can get the machine repaired if it runs into problems. In addition to these approved dealers, you can find Riccar machines at the Sewing Machine Outlet. One of the only authorized dealers that sells online, this shop offers several Riccar models, starting at around $130. eBay - The selection on eBay is continually changing, but you'll find machines from the 1950s, 1960s, and beyond. Be sure to examine the photos carefully and ask questions about the condition of the machine. You can also purchase parts for used machines from eBay. Etsy - This artist marketplace also has a section devoted to vintage wares. Sewing machines, including Riccar, are popular with buyers, and the selection is always changing. Bonanza - This online sales site sometimes has listings for used Riccar machines. As with eBay, the selection will vary. Check back from time to time if you're looking for a specific model. A few specific Riccar models are popular with seamstresses. Depending on your sewing experience level and machine requirements, one of these options might be ideal for you. At about $150, this simple machine would make a good beginner option or a starter machine for a child. 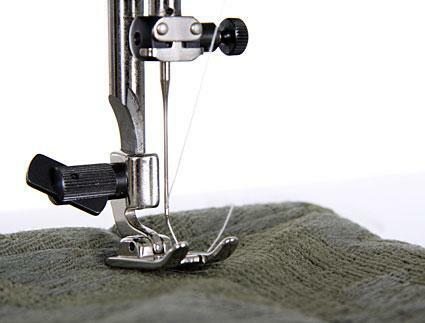 The Riccar Model 250 can perform two stitches and features a front-loading thread hook. This is a free arm sewing machine and comes with an extension table. Featuring 15 pre-programmed stitches, this mid-level Riccar retails for around $200. It includes a built-in stitch for making buttonholes and a reverse stitch that's activated with a simple push button. This machine will handle most home sewing needs, but it will not perform embroidery, quilting functions, or heirloom-style sewing. At the high end of the Riccar product spectrum, the Model R750 retails for around $800. It's designed for heavy use and can handle thick fabrics. It comes preset with 29 stitches, some of which are decorative. You can use the dials on the front of this machine to adjust tension, stitch width, and pressure. This is a good option for the home seamstress who needs a heavy duty machine but doesn't want to hassle with a computerized model. If you're looking for an all-mechanical machine that is affordable, a Riccar sewing machine might be a good choice even considering its limited availability. While these machines don't have all the bells and whistles offered by brands like Bernina and Brother, they do offer the worry-free operation that simpler machines can provide.